Born & died on Monhegan Island, Portland, Maine. One source has his birthplace as New Castle, New Hampshire; another says he was 'of Kittery' when he married Ann. Married Isabella on 24 November 1806; from Bristol, Maine. She was born around 1770, the daughter of Simon & Sarah (WILSON) Elliot of Londonderry, New Hampshire & Bristol Maine[Old Bristol & Nobleboro Maine VR to 1892, Vol. 2]. Had a shipping fleet and a fish-house on Monhegan where he received and prepared fish for market. Was also a farmer, raising cattle, sheep, crops. Built a large square gray Mansion on Monhegan called 'The Influence' which overlooks the narrow harbor and Manana, a nearby island. Jemima: 04 October 1759 - 06 August 1805; born in New Marblehead (Windham) Maine; daughter of Jos. & Mary (WOOSTER). Filed an Intent To Marry Ann on 19 May 1829 in Bristol, Maine and they married a month or two later. She was from Bristol, the daughter of Reverend Enos & Jane (ELLIOT) ; born around 1804 & still alive in 1870. She bore a daughter that died young, Joseph, and Abraham Baxter. She remarried George Legrow and moved to Wilton, Maine, where she died at the age of approximately 70 years. He was part owner of the schooner Betsy which was seized by the French in 1794. He built the schooners Joseph in 1811 (37 ton), EXPERIMENT in 1822 (44 ton), LEADER in 1837 (24 ton), and the Ann in 1829 (39 ton) . I thought you might enjoy this tale. 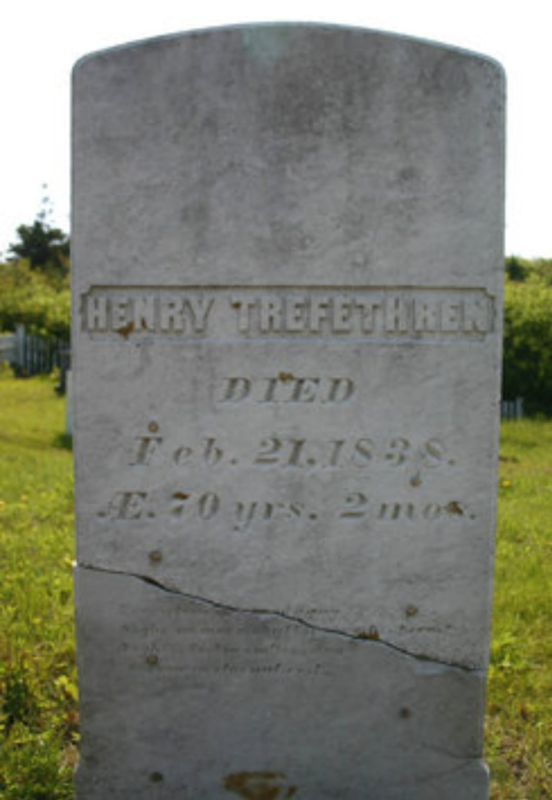 The "old Trefethren patriarch" was probably Henry5 TREFETHEN (Henry4-3, Foster2, Henry1) (#51) of Monhegan (1767-1838), husband of Jemima STARLING, Isabella (ELLIOT) McMURPHEY, and Ann BAXTER. Many years since two strangers arrived at the island and strolled about here for some days apparently without any particular object in view, other than fishing for cunners off the rocks. After some time they called on me and requested a private conversation. They stated that they were from the interior of Vermont and exhibited a paper which they said had been found among some old family documents and which they had every reason to believe was authentic. The document in question stated that on the Island of Monhegan on the coast of the District of Maine a remarkable rock would be found on a sandy beach, lone and far from any rock or ledge. At a given distance from this rock and at a given direction, money would be found by anyone who would dig; observing the spells and incantations in such spells made and provided. They had measured the distance and ascertained that the spot designated was in the vicinity of my house and they called to request permission to dig for treasure. I tried to dissuade them by ridicule and argument, but in vain; their faith in the document in their possession was too firmly established; and as to the goblin who guarded the hidden gold, they feared him not, and nothing would afford them greater pleasure than an encounter with the spirit of gold. I gave my consent to their request provided only that they should remunerate me for whatever damage should be done to my property in the delving operation. The next night at midnight was appointed for the trial. Despite the bold front they had assumed, I found that, as the time drew near, they seemed to have some apprehension of the danger to be encountered and had frequent recourses to the brandy bottle to keep up their courage. At midnight after sundry mysterious ceremonies and incantations, they commenced their work. After digging a short time, their delving instruments struck against a hard substance, when one of them uttered an exclamation and at the same instant, as one of them affirmed, the earth about the pit was violently shaken; one of the treasure seekers fell insensible, and the other scrambled from the pit and fled to my house. On arriving there he related in an incoherent manner what had befallen them and concluded by saying that he believed that his companion had been murdered by the goblins. However unwilling I might have been to disturb the quiet of this spirit of evil, I was still more unwilling to leave a fellow creature to perish in the pit which his own cupidity had formed and after some persuasion I prevailed upon the terror-stricken wretch to accompany me to the scene of his labor. Arriving there we found the man lying on his face in the bottom of the pit, to all appearances dead, but upon lifting him out, he slowly recovered and it was found that a stone had rolled into it, after having been thrown out, whcih probably struck the digger and occasioned the hurt. They recommenced their work and before morning the object of their search was secured, and a few days after they left the island and have never been heard of more by the inhabitants of Monhegan. "But," said I, as the old man concluded the tale, "did they really find the pirate money?" "They found that pot," said he, pointing to an old jar which stood on a shelf in the room where he sat. "Whether that would be buried in such a place for nothing, judge for yourself." I made some inquiries respecting the old veteran, and found that it was generally believed that the money-diggers gathered a handsome harvest under ground, and that he shared in their good fortune, as after the adventure, he seemed to be better supplied with money, and soon after purchased one of those pretty little green-painted pink-sterned schooners which are always to be found on our coast, or anywhere else where codfish and mackerel are to be found; and which are the veriest sea ducks afloat, it being as much impossible to capsize or swamp one of them as to sink the fast-anchored island where they most do congregate.